I LOVE chicken! I especially love my fried chicken and would have no problem eating at KFC, Popeye’s or Jollibee. But then I started eating healthier and then I turned to the Paleo lifestyle and now no longer eat food that has been cooked in the non-Paleo friendly oils. What’s a girl to do? Bake it! 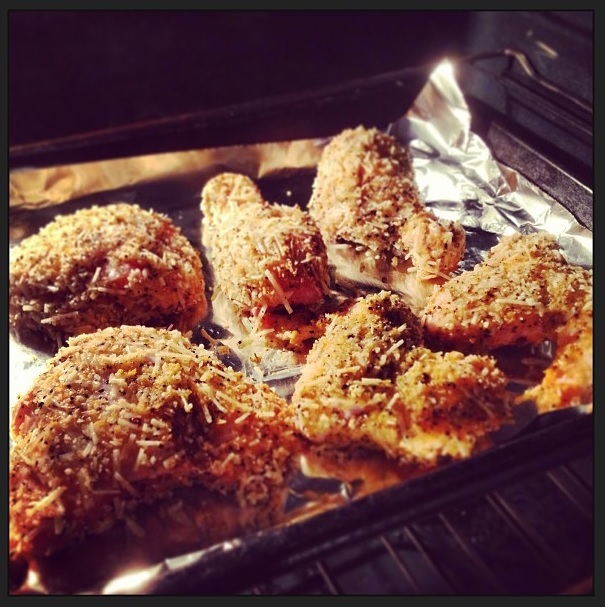 The end result is a moist chicken that is crunchy like it was fried, tasty, and hey look at that… healthier! Don’t worry my fellow Paleo people, I used coconut flour instead of all-purpose/wheat. We’re keepin’ it Paleo!! The recipe below is easy and I don’t measure much when I’m cooking so all measurements below are guesstimates. Please use your best judgment when you’re seasoning your food. 2. Grab three big bowls or something that is big enough to fit a piece of chicken so that you can roll it around in whatever is in the bowl without making too much of a mess. 3. In the first bowl you’re going to put about a 1/2 cup of coconut flour. (You may need to add more later so leave the measuring cup out). 4. In the second bowl you’re going to scramble 2 eggs. 5. In the third bowl you’re going to throw in the rest of the ingredients. 6. Your bowls are now lined up. You’ve got your raw chicken at the front next to the coconut flour, and a baking dish of some sort at the end. 7. Take a piece of chicken and cover it with flour. Tap lightly to release excess flour. 8. Roll chicken in egg. Let drip for a bit to take off excess egg. 9. Roll chicken in seasoning bowl and… you guessed it!! Tap off excess seasoning. 10. Place chicken on bakeware and repeat with the rest of chicken until you’re done. As you’re going through the process you might have to add more to each bowl so please be sure to WASH YOUR HANDS before you do this. 11. Pop the chicken into the oven and cook for 30 minutes on each side. Well you get my drift. If you don’t want cheese then omit the cheese and replace it with whatever you want. Want more garlic? Add it. 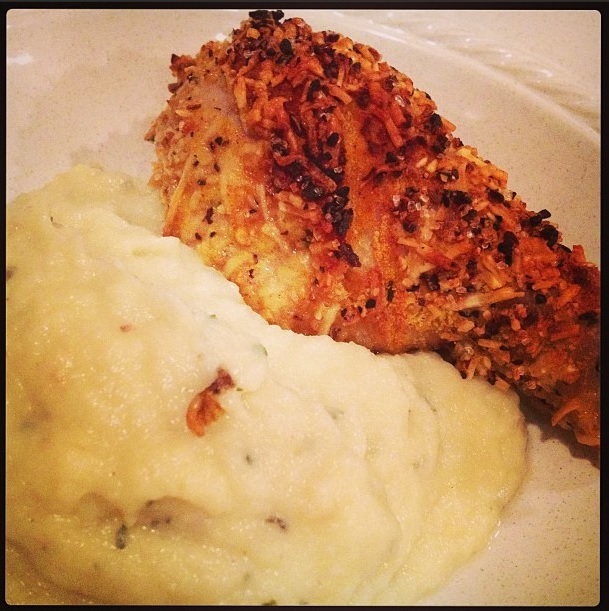 Want more herbs like Lemon Thyme? How about adding lemon juice to the eggs and it’ll be a lemon pepper chicken. Ooohhh…. the possibilities are ENDLESS!! Make it how you like it and you can’t go wrong. ENJOY! !